While walking through the woods, Hank finds an egg all alone on the forest floor. Spotting its home high up in a tree, Hank diligently tries to return the egg to its nest, but is met with failure each time. After keeping the egg warm overnight, he returns to the scene the next morning. To his surprise, he is met by another forest creature. Will they find a way together to see the egg safely home? Artist Rebecca Dudley crafts each tiny leaf, flower, and creature that appears in Hank’s forest in breathtaking detail, bringing the sunlit woods to life. 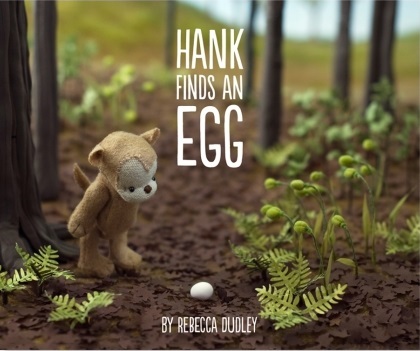 From delicate ferns to the glow of Hank’s little campfire, Hank Finds an Egg immerses you in its vivid miniature world. In this charming tale, told without words, Hank’s endearing and genuine kindness will inspire readers young and old alike to believe in themselves and the goodness of others. – Have the child “tell” the story for the pictures. – Discussion questions for students. A simple tale of kindness brought to life in a wholly original fresh new way. Ms. Dudley’s talents as a diorama artist blended with her photographic skills are a winning combination. I was blown away the first-time, second-time, even the tenth-time I read this story. Her individual panels and full-page shots tell a complete story that need no words. She uses different angle shots and changes her focus on near and faraway objects to bring about the key elements and pacing in the story. One of my favorites is the top-down shot with the nest of eggs in focus and Hank fuzzed out below. I liked that this was a simple story and easy to follow making it perfect for young tikes to ‘read’. (in case Peter Pauper Press or Ms. Dudley stop by – this story needs to be made into a board book!) Older kids will be amazed at the artistry and the “how did she make it” factor. Personally, I would love to know how she made those hummingbird wings. This wordless, simple story of kindness with fairy tale like scenery makes me feel happy and hopeful. I love how the innocence of children is portrayed through Hank. I do hope there are more adventures for Hank in the near future. I for one will be anxiously waiting. This book is good for story-time, lap-time and especially for a child to read on their own. Learn about Ms. Dudley’s unique writing journey (making dioramas, learning photography, self-publishing) to landing a traditional publishing deal. Also checkout Ms. Dudley’s website Storywoods to see more stories of Hank and his friends. A behind the scenes video at how Ms. Dudley creates these amazing dioramas and learn about her source of inspiration. Very cool book with the dioramas! Thanks for adding the video clip. Glad you enjoyed the video. Thanks! Glad you picked this one- utterly adorable! It is adorable. There is something about photography and the sequencing of shots that is just amazing. There is a book trailer however I didn’t feel it did the book justice even though it has shots from the book. Hope you get a chance to read it. My daughter would love this! I think it might be my life long dream to illustrate a wordless story. I didn’t know you illustrate, that’s so cool. I can barely draw a stick figure. Right now I am trying to “write” a wordless picture book. It is hard. I am trying to think visually. What a sweet little book! Thanks for sharing it Darshana. Thanks for stopping by Jarm! How cute! I admire illustrators who do this kind of 3-D work. Thanks for the recommendation. I was blown away by this lady’s talent. She definitely has a gift. This is so creative. I’ve had this one on my to-read list. Library doesn’t have it so I may have to order it! I was able to get the book through the inter-library loan system. But I love it so much I will probably buy it too. Oooh — a book without words, but gorgeous illustrations. Love the idea of having the child tell the story. Great choice! Hi Pat. This is a great book to have a young child tell the story as it is easy to follow. A straightforward, simple storyline to which the photo stick close too. looks very heartwarming and wonderfully done.I enjoyed watching the author explain about the making of the book. Thanks for sharing! Glad you enjoyed the video Reshama. 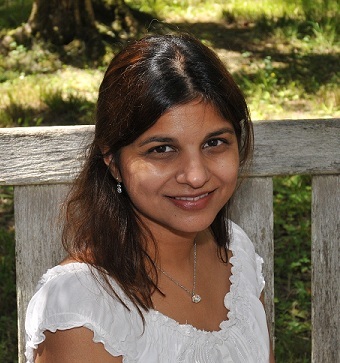 Ooh, this looks wonderful, Darshana! I can’t wait to find time to watch the video! And of course I’m dying to know whose egg it was and how Hank (and whoever helps him) gets it back in the tree so I guess I’ll have to find the book 🙂 The story line reminds me of Flap Your Wings, which begins with a boy finding an egg lying alone in the path and wondering to whom it belongs. Thanks so much for adding this one to our list! Hi Susanna. Hope you get a chance to check this title out. The behind the scenes video is nicely done and gives you are real feel for the artist. I do hope Ms. Dudley’s artwork gets more attention. Oh my goodness, those picture are just too adorable. I can see this being a great classroom success! It is a very sweet, touching book. I think it would do well in pre-schools. Well, my best buddy when I was a pup was a big guy named Hank. So right off, I’m attracted to this one. And I really like wordless books. I like reading pictures. And these pictures are great! thanks for sharing the book and the video! Thanks. So sweet. Glad you enjoyed the video, hope you get to read the book. I actually don’t know much about hummingbird eggs, you might be right. Glad you enjoyed the photos, the work in the book is breath taking. The pictures look amazing. I was mesmerized by the dioramas and results in the video. I’ll need to add this book to my ‘egg’ library!